Fresh Step has once again teamed up with the ASPCA to help fill your closet with cat fashion for a good cause! 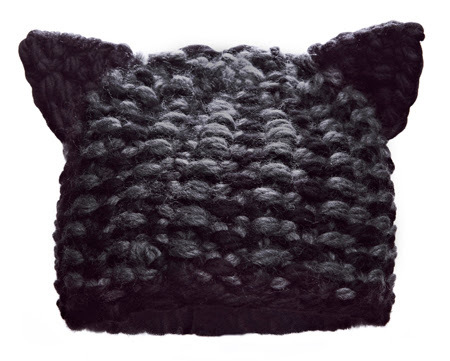 After collaborating with Kellie Pickler last year on a country music inspired cat sweater, the litter makers have switched their focus to a feline-themed accessory, in the form of a cat hat by Korean knitwear designer, Sunghee Bang. The chic popcorn knit cap is a subtle mix of black and grey, and features a striking pair of pointy ears that will keep you warm all winter. The limited edition hat is currently available from the ASPCA online store for $39.99, with 100% of the purchase price going to benefit the animal rescue and welfare organization. To lend a little star power to the proceedings, the hat will officially be unveiled this weekend by famous cat lover, AnnaLynne McCord, in Park City, Utah, where the "90210" actress will be in town to introduce the five finalists from the Fresh Step Catdance Film Festival competition. Starting on Jan. 20, fans will be able to view all of the official cat video selections from the film fest online, and cast a ballot for their favorite to win $10,000. As an added incentive to participate, all voters will also have a chance to win prizes, including Fresh Step coupons, and the charitable chapeau.